I had a "check out my card" post ready to go this morning, then I couldn't get my computer to connect to the internet before I had to leave for work, so I'll save that one for tomorrow! For now, I'll show off some cards I got in today's mail... a trifecta of sorts: a trade, a prize and a purchase! This is my loot for coming in third place in the "Blog Of The Year" contest over at Jaybarkerfan's Junk. Thanks to those who voted for me, I know I wasn't the most popular choice and deservedly so, Night Owl runs an AWESOME blog and I hope some day to be viewed the same way in the eyes of my peers. Thanks for the votes, thanks Wes for running the contest and I hope it was as fun for everyone involved. I really dig the Bagwells as I've recently done a lot of organizing and now have all my Bagwell cards in a binder, I'll now start in on Biggio with Berkman to follow! Thanks Wes!!! 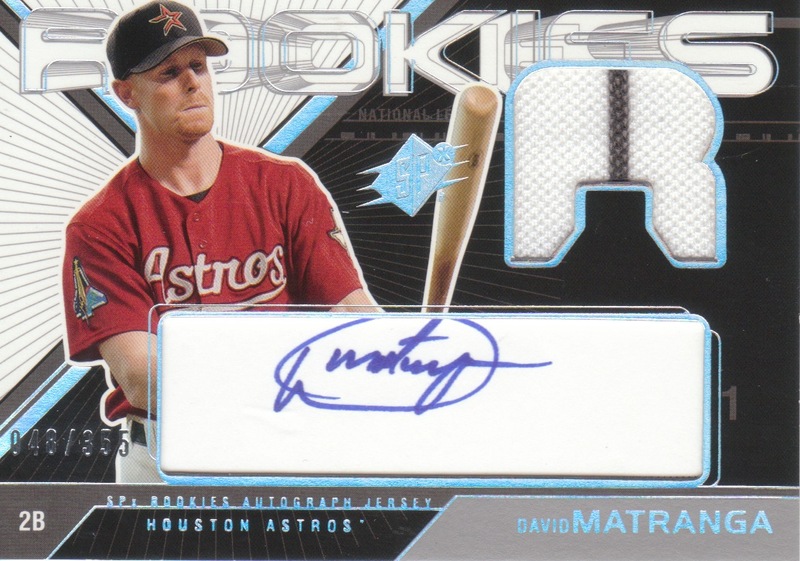 Dave Matranga was on the MLB squad a couple of years, and while I was on the grounds crew at Minute Maid park. Nice guy and I really wish his career had turned out a bit better. I was so focused on the auto that I didn't even notice it had a jersey swatch as well! (I am a dimwit after all.) Anyways, this is a trifecta Rookie, Auto & Relic and I couldn't be happier... thanks Josh! Yea, for the price I got these, I basically stole them! I was pretty excited. Anyways, this leads me to the tease I put up in the title... a new quest... well, if you go check out my Gypsy Queen Want list, I've added a section for Mini-Relics! 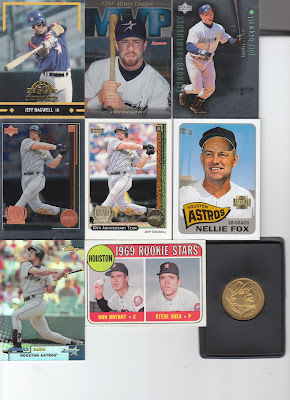 There are only 24 mini-relics in the set, I now have 7 (I already had Prince Fielder and Nolan Ryan). So that already puts me at almost 1/3 completion! 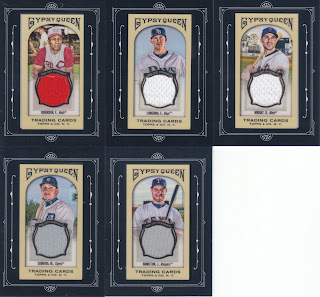 Anyways, if anyone has GQ Mini-Relics to trade, by all means, let me know. I'm definitely interested! I'm kind of bummed that I didn't decide to collect this set last year when I started busting GQ, as I pulled the Rickey Henderson, Cal Ripkin, Barry Larkin and Stan Musial cards from packs myself and traded them all away... or before I traded the Utley away to Greg... Now here's hoping someone has them and would be willing to let it come back to me or trade me an extra! Anyways, I'm up for any trades you might propose, as long as it nets me a GQ Mini Relic I need, feel free to throw an offer out there! Glad you like the card. If I get any more 'Stros, they're headed your way. 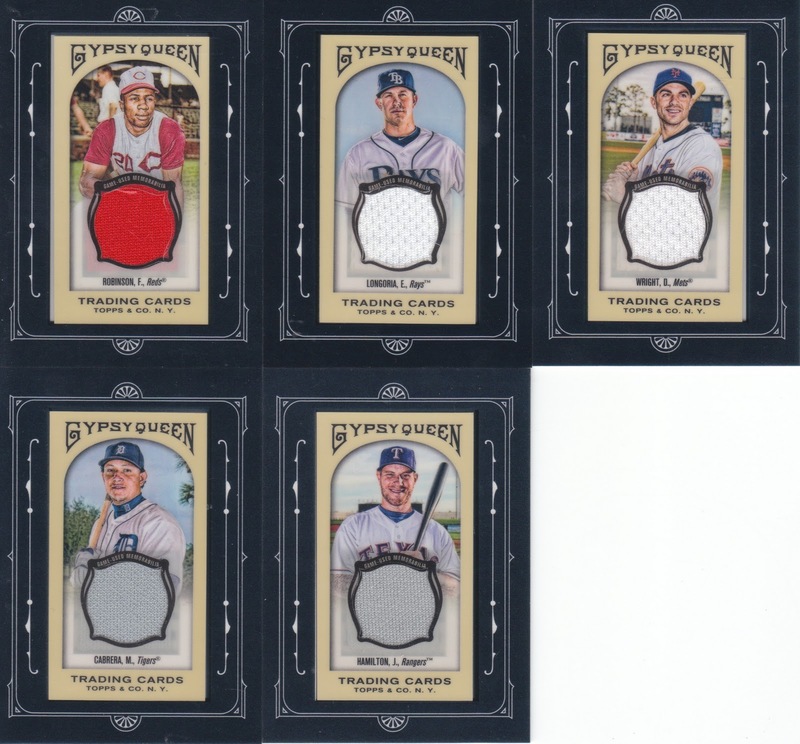 best of luck on the gypsy queen mini relic set... it's a beauty. I've still got the Henderson and can send it back your way.